First contact resolution is a metric used by companies to measure the percentage of customer inquiries that are resolved by a service team on the first interaction, representing overall customer satisfaction. Live chat apps are sometimes used as the first point of contact to quickly solve customer inquiries on the first interaction in an efficient way. For example, a live chat tool like Freshchat offers an efficient, first contact solution with both live agents as well as integrated chatbot functionality, giving you the ability to answer customer questions 24/7. Find out more about Freshchat’s service and sales features by visiting its website and signing up for a free, 30-day trial. One way to increase your first contact resolution rate is to use chatbot solutions that are driven by artificial intelligence. Statistics show that it takes only 42 seconds to solve problems using live chat so that customers have come to expect quick service. However, this isn’t always possible for a number of reasons. Enter chatbots. Chatbots automate conversations quickly, can answer frequently asked questions (FAQs), and can respond to multiple conversations at the same time, unlike live agents. They can also be deployed 24/7 so that even after business hours, there’s a channel for customers to get answers. Many customer service questions can be answered initially with a FAQs section. Include FAQs into your bot window to answer the most common questions quickly. For example, if “What is your return policy?” is the question, your answer might be, “You have 30 days to return merchandise. Click this link for instructions.” The linked page gives the customer detailed instructions, sets expectations, and notes any exceptions to the policy. Webhooks allow information to be passed and retrieved between applications. They can be integrated into a bot and connected to an internal platform, retrieving the appropriate data on command from the customer. For example, if you sell merchandise online, you could integrate your e-commerce platform to send invoices, place orders, and accept payments through the bot window 24/7. By creating categories for all of the most common questions and including them in your chat message, you can reduce the time your agents spend answering the basics. For example, you can create a category for scheduling a demo and provide a link to a meeting scheduler for your sales team. Like a phone tree, these categories also act as navigation prompts for customers if they’re unsure of where to begin. 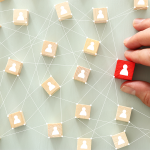 The chat window on your website is not the only way to connect with customers. It’s not always the most convenient method nor is it always the most technologically reliable. Give your customers a variety of ways to chat with you so that you get the opportunity to achieve first contact resolution. Options for centralizing customer support include Facebook Messenger, short message service (SMS) and text, and landline phone. With 1.2 billion Facebook Messenger users, it makes sense to use this app as another channel for the first touch, especially since your business is likely already using Facebook to post content and interact with customers. 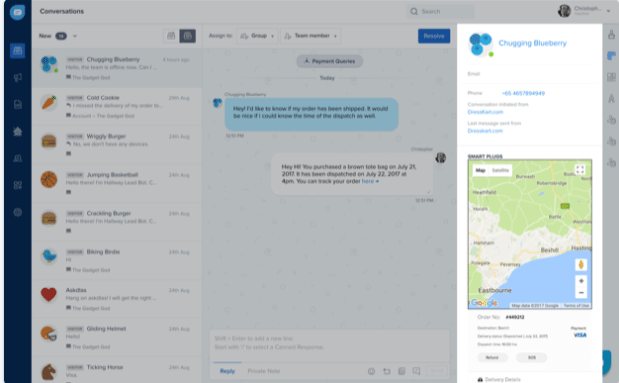 Facebook Messenger integrates with most live chat software to make it easy for customer service agents to communicate directly from their chat window. Because texting is popular, why not offer it as an option for live chat support? Rather than using a chat window, a customer clicks on a phone number on your website to begin a chat with text. The customer service agent receives the text and responds right from their chat software. Texting is usually a more reliable connection than an internet-connected chat, and it gives the customer a readily available record of the conversation. 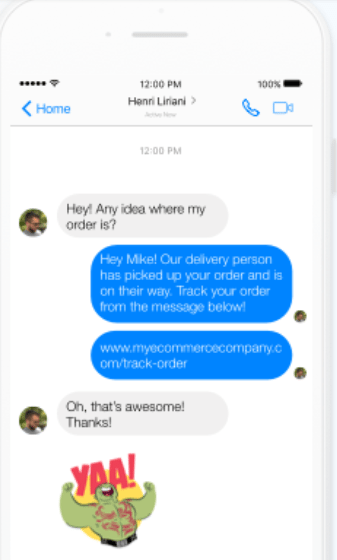 Offering support channels like Facebook Messenger and text gives your customers the ability to communicate in a way that is convenient for them, therefore improving the customer service experience. However, not all live chat tools work with these services. Freshchat includes a Facebook Messenger integration that is easy to install and allows agents to respond directly from their chat windows. Learn more about available integrations by visiting its website. Integrating live chat with a customer relationship management (CRM) tool saves both you and your customers’ time by providing background info and context while engaging in a chat. For example, a CRM can show shopping history for an e-commerce customer including what they purchased and when. This can eliminate the initial back and forth questions, arming agents with the context to have more contextual conversations. Before even starting a customer chat, some CRMs offer the ability to display a history of purchases, site pages visited, and what, if any, service contact they’ve had before. This information may also inform whether the agent will need to enlist the help of someone more experienced. All of these details will help the agent determine why the customer may be calling, and how they need to approach the call. A CRM can also be used to identify upsell opportunities by providing more detailed insights into the needs of a customer. This does not mean an agent needs to sell every customer. After all, the goal is to solve a service-related issue. However, sometimes those service issues are only solvable with a purchase. Pull up contact information and location with Freshchat. For example, a customer’s mobile phone bill spiked last month because of data overage. The CRM shows the customer started a new job as a traveling salesperson. The overage was a result of the customer not connecting to Wi-Fi while on the road. To resolve, the agent waives the overage charges and recommends purchasing extra data, which is far less than the overage charge. This makes sense to the customer, happy to be covered just in case. For businesses with multiple agents and departments, the ability to route conversations quickly and to the right agent is crucial for resolving customers on the first contact. The right agent is the one who has both the time and the skills necessary to handle a particular chat and is also part of the right team. For example, a customer with a software issue should be routed to technical support and not billing. Simple enough, but that’s just beginning of the ways to make your first contact resolution with live chat more efficiently. By setting up routing rules for chats based on specific “if/then” parameters, you ensure that your customers always get to the right agent. Set up filters first by department so that they are easy to manage and can be created with department-specific rules that may or may not change over time. For example, a pricing and billing rule may use a keyword filter that assigns to that department any time a customer types either “billing” or “pricing” into chat. The more automated a chat system is, the more efficient your team will be resolving customer issues. Having software that routes conversations by filters or skill level will prevent long wait times and improve resolution times. This also takes the task of assigning chats out of the manager’s hands, saving them time and the potential for human error in assigning the wrong agents. With live chat software like Freshchat, you can filter conversations using different identifying parameters and assign chats automatically based on an agent’s skill at handling multiple chats. This ensures your customers will be handled by the right agent and will reduce the time of their conversation. Best of all, this feature is found in the free version, which you can start using by visiting its website. For customers who might need an extra hand at having an issue resolved, co-browsing allows an agent to view the customer’s screens simultaneously and take control of their browser if needed. This feature can be particularly useful for customers with technical issues. For example, if a customer who is not technically savvy experiences a problem with their computer’s security software, an agent can step in, drive, and resolve quickly. The goal should be not only resolving issues on the first contact, but it should also be doing it satisfactorily. Sometimes, that means more than just telling a customer how to do something. For more complex issues or ones where the customer doesn’t have the skills, co-browsing can expedite the conversation and lower the frustration felt by both parties. This will result in increased customer satisfaction and loyalty. There’s a saying that happy employees lead to happy customers. One way to make employees happier is to help them become more engaged. In fact, highly engaged business units achieve a 10% increase in customer metrics, according to a Gallup study. Co-browsing lets employees become more engaged with their work and with customers. They can solve issues faster with less frustration for them and the customer, leading to increased productivity. You’ve set up the necessary filters to route your customer to the right agent, but sometimes getting to the right agent isn’t enough. Sometimes it takes a village or at least a team to resolve an issue. The collective knowledge of agents puts the company in a better position to solve problems, especially on the first contact. There’s nothing more frustrating to a customer than getting transferred like a hot potato because each agent she talks to lacks the expertise to help. This can be avoided with group chats, but the concept must be made into reality first. This means understanding the service team and who internally has the expertise to help. It also means knowing who of those qualified to help are available. Using chat tools like Slack can facilitate internal communication. Another way to approach chat issues is the use of what is commonly called a whisper. 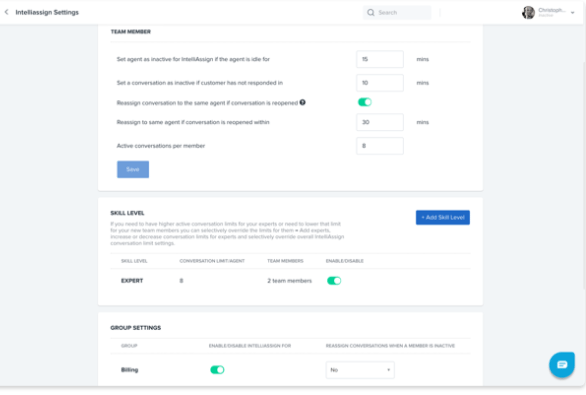 If your team is small or other agents aren’t available for a group chat, whispers allow a manager to help an agent in real-time. Whispers, which are not found in all chat platforms, allow another user, usually a manager, to view a chat conversation between the agent and customer. Most importantly, it allows that person to send messages inline to the agent without being visible to the customer. Not only can this help solve an issue faster, but it can also be used as training for the agent. It also allows more experienced agents to “whisper” to another agent who is taking on a complex issue. This will reduce customer transferring and increase the likelihood they’ll be resolved during the first contact. With the variety of free communication integrations available, it makes sense for a small business to employ tools that will make them more efficient and allow additional flexibility for their clients. Fortunately, most live chat solutions provide integrations for many of the most popular third-party applications like Facebook Messenger, Slack, and Google Analytics. Take advantage of the integrations that make sense for your customers and your team. Both customers and customer service agents alike should have the right tools to make communication easier. A website’s live chat window is not the only way to do this. For example, Facebook Messenger with its 1.2 billion users clearly caters to many users. Integrate this popular channel with your chat software, and it will funnel customer Facebook messages directly to an agent’s chat window optimizing the experience for both. 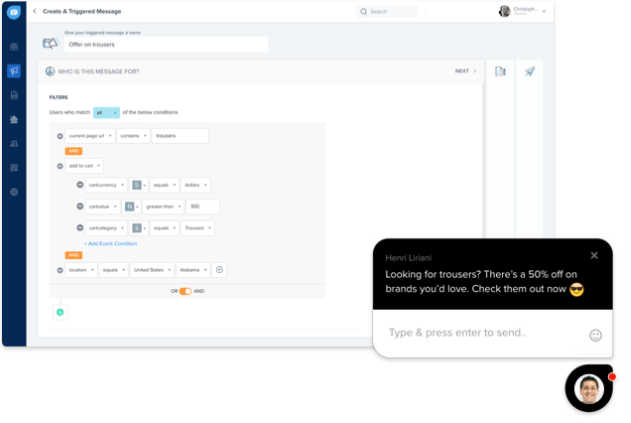 The popular messaging app Slack, when integrated into live chat, automatically funnels chat messages to an agent’s Slack window where they can then engage the customer. This eliminates the need to toggle back and forth between chat app and Slack. If you want to find out more about Slack, visit our Slack user review page. Live chat software should provide integrations for these popular applications. For example, Freshchat can be integrated easily with Slack and Facebook Messenger, allowing agents to resolve issues from their chat window without having to go to these apps. It also includes helpful push notifications and email alerts, ensuring you notified whenever there is an issue to address. The overwhelming reason consumers abandon shopping carts is that of high extra costs. For example, the shipping costs are more than the item they’re purchasing. Instead of shocking customers and potentially losing a sale, reward them by sending an automated chat message that offers free shipping, possibly inducing them to hit the purchase button. With the average abandoned cart rate at 70%, it pays to understand the reasons why potential customers are getting through your net. Use chat feedback surveys, behavioral indicators like heat maps, and analytics data to try to determine the reasons. If they’re abandoning because of shipping fees, offer them free shipping with chat at checkout if, for example, it takes them longer than one minute to complete the transaction. The more customers engage with your service team the greater opportunity you have to satisfy them. Use this to your advantage by providing them with incentives. For example, create a filter that prompts a discount for customers that have had two or more chat conversations in the last month. Even better, let your agent offer the discount during the chat for a more personalized way of saying thank you. Messaging software like Freshchat can monitor user activity on your website including time spent on checkout, shopping categories, and items added to cart. Use these insights to send messages proactively and ask for customer concerns. Setting up triggered messages using Freshchat. If first contact resolution was easy, all businesses would be batting 100%. Chatbots aside, it’s entirely human, and humans make mistakes. One way to reduce mistakes is always to be making improvements whether it’s agent scheduling, training, or overall customer satisfaction. You can’t improve what you can’t measure, so a good place to start is using data to understand where you are and where you want to be. Live chat data gives you the ability to manage sales and service teams better. Keep your finger on the pulse of the team at any time using real-time monitoring. This dashboard should contain all of your important day-to-day metrics like chat volume, first response, response time, and resolution time. It’s not designed for micro-management, but to highlight areas that need immediate attention. For example, if one of your agents seems to be spending more time than usual on chats, find out why. Maybe they are getting a number of complex queries that are taking longer than usual, and some of the chats in their queue will need to be reassigned to another agent. Where real-time monitoring provides a snapshot of the day’s activities, reports take the long view to track performance. The views in reports you can create by using a live chat first contact resolution strategy can be broken down by individual, department, and overall businesses with options for custom time periods. Use these to make staffing decisions, track goals and identify areas of concerns. Why Does First Contact Resolution Matter? Because live chats are being used more and more, resolving customer disputes in 42 seconds, on average, customers have high expectations to be resolved on the first contact. Resolutions requiring more than one contact add time and are less likely to provide a satisfactory experience. Divide the number of resolved incidents on the first interaction by the total incidents and multiply by 100. For example, 74 chats resolved the first time divided by 120 incidents = .61 x 100 = 61%. What Is the Average First Contact Resolution Percentage? According to one research report, the average first contact resolution rate is 70%. 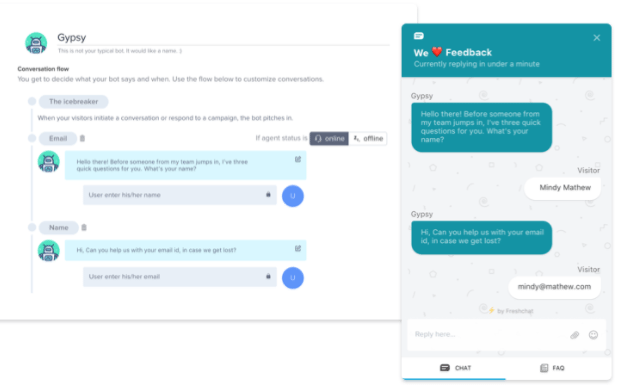 A live chat first contact resolution strategy is a great way to monitor customer service inquiries or support tickets while also providing data that can help you measure results. What Is the Difference Between Screen Sharing and Co-browsing? Screen sharing allows one user to share their browser with another. Co-browsing or collaborative browsing allows one user, usually a service agent, to log into their customer’s screen, taking control of the browser to show them something or assist with an action. What Are Some Common Chat Metrics I Should Be Reviewing? The common metrics provided in most dashboards are conversation volume, first response, response time, resolution time, incoming conversations compared to resolved conversations and customer satisfaction ratings if deployed. First contact resolution is one way to gauge overall customer satisfaction because it measures the efficiency of your service department. It’s also an indicator of the overall health of a service team as it’s a reflection of how the department is structured, managed, and then conducted by the agents. A live chat first contact resolution strategy is a fast and easy way to improve the customer service experience as well as improve your first contact resolution rate. The features of Freshchat not only make it easy to communicate with customers but also give your service teams the tools to succeed as your business grows. Visit Freshchat today to schedule a demo or start a free trial.